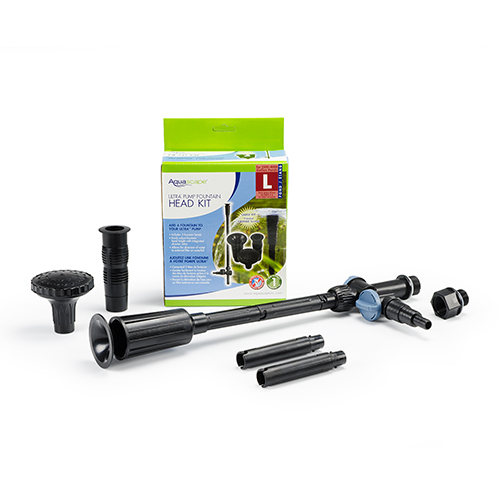 This fountain head kit was made specifically for the Ultra Pump. I've seen reviewers complain that there were no fittings to match other pumps. I agree. This kit includes an adapter that is 3/4" female on one side and 5/8" male on the other side. First, you'll find no 5/8" PVC fittings at any home improvement store. Second, threading on the 3/4" side does not match the threading on a 3/4" male PVC fitting that you'll find at the home center. I have a TotalPond 1200 pump with an output nozzle that is 1 1/2" male threaded. You screw onto it a barb fitting for a 1" ID hose. It turns out that the diameter of the barb fitting exactly matches the diameter of the bottom input to the diverter that comes with the fountain. I happened to have a length of 7/8" ID clear tubing left over from my aquarium. The tubing wall is 1/8" thick and is pretty rigid. I cut off a 1 5/8" length of that tubing, slipped on two hose clamps and attached the fountain head diverter to the barb fitting on my pump. I applied some silicone grease to the fittings which made it easier to slide the tubing onto the fittings. Once you tighten the hose clamps, you have a rigid and tight connection. I cut off the diverter's smaller outlet barbs that lead to my waterfall leaving me with the largest barb that fits my 1" ID waterfall hose. The diverter valves for output to the fountain and to the waterfall are great! I can custom set them to have the perfect fountain output and waterfall output. Having a choice of three different fountain heads is nice. I'm happy now that I found a way to connect the fountain to my pump.